The Great American Songbook is in need of all the reinterpretation it can get: one tires of the earnest, closely-miked voices and soft — no, softer — no, even softer — accompanists of the cabaret world. Brian Wilson has reinterpreted the music of George Gershwin with energy, wit, and moments of considerable beauty. He is in fine voice on this recording and, it would seem, fine spirits. The most-hyped performances here seem to me the weakest. The two fragments of Rhapsody in Blue, for Wilson’s stacked vocals and strings, feel oddly truncated — not even all of the Rhapsody’s most familiar theme is here. On Orange Crate Art, stacked Wilsons sounded loopily beautiful. Here, they sound like someone singing in a hall of mirrors. The effect is unnerving. Now we can duplicate the universe. On “Nothing But Love,” which seems to me a slighter song, Wilson’s voice is swamped by an overly busy arrangement. The best performance on this album is, for me, wholly unexpected: “I Loves You Porgy.” The arrangement is appropriately understated, and Wilson’s singing is engaged and genuinely affecting, with no trace of self-consciousness. When I think of the grief that, say, Mike Love might have given “cousin Brian” over this song (“Hey, guys, Brian’s ‘got his man’”), I hear in this performance a quiet triumph of grown-upness. Scott Thomas, Design Director of Barack Obama’s 2008 campaign, has put together a book, Designing Obama. It’s also available as a free (free!) PDF. Like every other graphic designer I know, I watched the live images of campaign rallies from Toledo to Topeka with a growing feeling of awe. Obama’s oratorical skills were one thing. But the awe-inspiring part was the way all the signs were faithfully, and beautifully, set in Hoefler & Frere-Jones’s typeface Gotham. While waiting for two pre-production Blackwing pencils to arrive in the mail, I began thinking about an old song: “(I Love You) For Sentimental Reasons.” Sentimental reasons are reason enough to like the Blackwing: the sheer dowdiness of the design, the roster of distinguished users — Archibald MacLeish, Nelson Riddle, Stephen Sondheim, and John Steinbeck among them. Somewhere — where? — I’ve seen a photograph of Duke Ellington with Blackwing in hand. The Blackwing even boasts a slogan — “Half the Pressure, Twice the Speed” — as if this pencil were a personal brand, like a cigarette. Sentiment aside, the Blackwing is a pencil whose smooth lead makes writing a simple pleasure. I’d walk a mile for a Blackwing. California Cedar Products’ choice to revive the Blackwing cannot be explained by profit motive alone. It’s a labor of love, evident most obviously in the recreation of the Blackwing’s distinctive ferrule. (The breakage of expensive-to-repair ferrule-making machinery helped bring production of the original Blackwing to an end.) The care that has gone into the new Blackwing’s manufacture is considerable: I immediately noticed that each pencil’s ferrule and imprint are in alignment, so that the Blackwing name is visible when the pencil lies flat (that’s not the case with every old Blackwing). My new sample Blackwings are not perfect: one has minute specks of gold paint on the barrel; the other has thin black streaks across the imprint. (The streaks are visible in the photograph above.) As Henry Petroski notes in The Pencil: A History of Design and Circumstance (1992), few pencils, if any, turn out to be perfect when subject to close inspection. Writing with the new Blackwing is a pleasure. The lead is soft and smooth and doesn’t smear, though now and then a tiny crumb breaks off. The new Blackwing’s point wears more quickly than that of the old Blackwing, and the new pencil’s line is noticeably darker. (An older California Cedar HB Palomino pencil in my possession is, to my surprise, darker and softer still.) The new Blackwing’s eraser works well but not perfectly, leaving a slight trace of lead on a yellow legal pad and a slight sheen on a Moleskine calendar page. But this eraser doesn’t destroy paper, as the erasers on my old Blackwings do, and did, even when new. The differences in appearance between the old and new Blackwings are many, and likely — for sentimental reasons — to be significant to the dedicated user. The brand name appears in larger and more eccentric lettering on the old Blackwing (note especially the C, K and G). The imprint on the new Blackwing is not nearly as crisp, though the lettering does have the advantage of being readable in any light. The Blackwing slogan is missing from the new pencil: perhaps the cost of printing on two sides of the barrel is prohibitive. Most important though, I think, is the change in color. The old Blackwing has been described as charcoal-grey or smoke-grey, but I prefer to think of it as graphite-grey: the Blackwing has the shiny grey look of pencil lead itself. The black, gold, and white design of the new Blackwing is not nearly as attractive. To my eyes, it suggests a now-dated idea of luxury, reminiscent of hair-tonic bottles and whitewall tires. Yipes. My suggestion to California Cedar: the visual appeal of this pencil is likely to be as important to potential customers as the quality of the lead. Witness the speculation that just brewed about whether the Blackwing slogan would appear on the barrel. Change the color of the barrel to graphite-grey, drop the gold band, and enlarge the Blackwing imprint. Stamp the Blackwing slogan on each pencil if that can be done at a reasonable cost. A pink — or grey? or black? — eraser would be a significant improvement. Appearances aside though, the new Blackwing offers a writing experience that will be a pleasure in any color scheme. 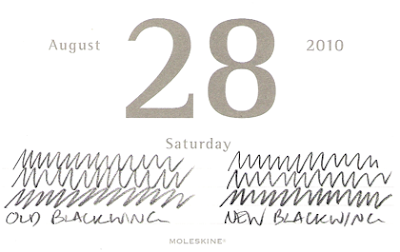 September 13, 2010: Production Blackwings are now en route to the States from Japan. It’s not clear whether they differ in any respect from the pre-production samples. September 15, 2010: California Cedar has been, I think, misleading — at best — in describing these pencils as “pre-production” samples. I evaluated the new Blackwing with the understanding that my comments (and those of other Blackwing fanciers) would help to shape the finished pencil. The very short turnaround time between the distribution of samples and the shipping of finished pencils to the States now makes clear that changes in design based on users’ evaluations were never in the offing. The “pre-production” Blackwing, it turns out, is the new Blackwing. So why send out “pre-production” pencils? You can read Cal Cedar’s explanation here. There’s more discussion (and a bit of subterfuge) in the comments on this post. I for one won’t be buying — not because of the new Blackwing’s design but because of what I consider to have been a misleading marketing effort. Timothy Egan and Leonard Pitts, Jr.
A growing segment of the party poised to take control of Congress has bought into denial of the basic truths of Barack Obama’s life. What’s more, this astonishing level of willful ignorance has come about largely by design, and has been aided by a press afraid to call out the primary architects of the lies. 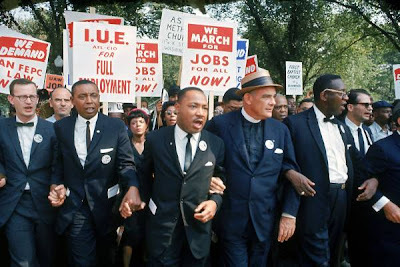 The fatuous and dishonorable attempt to posit conservatives as the prime engine of civil rights depends for success on the ignorance of the American people. Namby Pamby, a disparaging alteration (a reduplication with variation of initial consonant and suffixation … in imitation of childish speech) of the name of Ambrose Philips (1675-1749), author of sentimental poems (especially concerning children). Philips’s poems were ridiculed in print by Henry Carey, John Gay, Alexander Pope, and Jonathan Swift; the nickname Namby Pamby was used by Carey as the title of his parody of Philips’s verse, and subsequently by Pope in the Dunciad. From galloping couplets to William Carlos Williams-like enjambment (“he // who,” “of / your”), from a glowing bosom and “dewy Damps” to flame and dripping sweat. Note too that Philips’s translation is far from clear on the direction of the speaker’s desire, which is not for the youth/godlike man but for the woman speaking to that man. That Sappho was a woman who wrote of love between women always surprises some students, who assume that the poem presents a heterosexual love triangle. (Not that there’d be anything wrong with that!) Such a triangle is the scenario in Catullus’s Latin adaptation of this poem, which “straightens” Sappho’s lyric into an expression of male heterosexual desire. There’s nothing namby-pamby about Sappho, or Catullus, or Mary Barnard. At one time this post had little competition. Now there are several pages online offering similar guidelines. At least three are remarkably similar to my post in their content and sequencing. (Remarkably, remarkably, remarkably similar.) Two appear at eHow as the work of unnamed contributors. One appears at StudentStuff as the work of an ex-English major. She should know better. I have no idea what kind of traffic these other pages get. But I’m happy to see that a Google search for how to e-mail a professor still finds my post at the top of the heap — old and unimproved, and using only original parts. Update, September 2, 2010: I’ve received no reply to my e-mail, but eHow, to its credit, has removed the two anonymous items from its website. The piece is StudentStuff still stands. I’ve e-mailed again, requesting that it be removed. Update, September 2, 2010: The writer at StudentStuff has removed the borrowings from her post. Case closed. I can’t help thinking of it as heroic narrative: the late, great Blackwing pencil has returned, thanks to California Cedar Products. I’m one of the fortunate people chosen to receive pre-production pencils. I’ll have a review in the near future. For now, The Blackwing Pages has photographs and a short review of the new Blackwing. Archaeologists claim to have discovered the remains of Odysseus’s palace on Ithaca. Five years ago, an archaeologist claimed Cephalonia, not Ithaca, as Odysseus’s home. Perhaps Odysseus, like Rod Blagojevich, commuted to work? Edward Kean, “chief writer, philosopher, and theoretician” of The Howdy Doody Show, has died. He gave our language cowabunga. It’s a poster: Grand Taxonomy of Rap Names. That postcard confirmed my sense that my professor was a nasty, sarcastic man. He was after all the same professor who had criticized my writing all semester, pointing out my dangling participles, my pointless rhetorical questions, and my constant use of the word this to begin sentences. And now he was intent on somehow souring my A for the semester. But I couldn’t have been more wrong in my thinking. As a junior, I took two more courses with Jim Doyle, James P. Doyle, and began to realize that he was the most generous, most inspiring teacher I would ever know. When I was a freshman though, hugely insecure about my ability to negotiate academic life — and hugely insecure about everything else — I couldn’t see what now seems plain: my professor was making a joke when he wrote that postcard. He was an English teacher, after all, joking about his own inadequacies, and trusting that I was smart enough to get the joke. I wasn’t. Most professors are happy to recognize improvement in a student’s work. I sometimes see students go from Fs and Ds to Bs and As in the work of a semester. Seeing a student begin to take interest in a class and improve her or his work makes almost any professor feel a bit happier and a bit more successful. The student who feels categorized by a first grade might be the victim of a self-fulfilling prophecy: if you feel that you’re never going to do better than, say, a C+, there might be little reason to try to do better. Most professors are more than willing to acknowledge that multiple interpretations or points of view are possible and plausible. Professors are much more interested in your ability to develop and support an argument than in agreeing with that argument. They are likely to admire an effort to develop a position that gives them something to think about and, perhaps, argue with. And by the way, professors don’t “give” grades. Your work is what earns them. Most professors value clear, cogent, well-informed reasoning and writing. Different expectations are often a matter of different disciplines, not different professors. The wordplay that wins respect in Creative Non-Fiction might not go over well in Business Communication. The single-sentence paragraphs appropriate in Intro to Journalism won’t work in Intro to Literary Criticism. But that’s because different standards apply in each field, not because professors are insisting on their own idiosyncratic recipes for good writing. And while different professors might place more or less emphasis on various writing errors, that doesn’t mean that comma splices are sometimes okay and sometimes not, only that some professors might be paying more attention to your writing than others. When professors do want things their way, it’s likely to be about relatively modest matters — paper clips rather than staples, serif rather than sans serif fonts. If you were reading hundreds of essays, you’d probably get a little particular too. Some don’t. Most do. But professors recognize that it’s a student’s choice to show up or not, to take notes or not, to follow a discussion or lecture or drift away in inner space. It’s unlikely that a professor will extend a favor to a student who has frequent unexplained absences or whose presence in class does nothing to help the cause of learning. This misconception, unlike the first four, is rarely articulated. It’s pervasive nonetheless among students who practice various forms of educational gamesmanship — reading plot summaries instead of novels, plagiarizing essays, cheating on exams, concocting phony excuses for late work and absences. 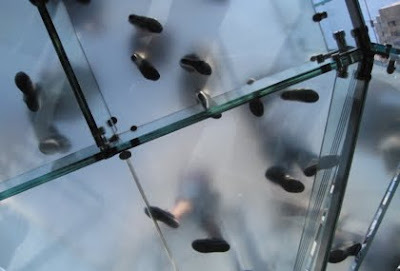 Students who see their professors as obstacles would do well to consider that their own attitudes are the real obstacles to graduation, impeding any possibility of genuine learning. You may encounter a professor who will confirm every misconception I’ve described: someone who does decide semester grades early on, who allows no disagreement, who is arbitrary and idiosyncratic and oblivious, and who really does make life miserable. When you encounter such a professor, run — if that’s possible. Such professors betray not only their students but the very idea of learning. Most professors are better than that though — if your eyes are open enough to see them. three.sentenc.es is a personal policy that all e-mail responses regardless of recipient or subject will be three sentences or less. It’s that simple. The policy is also available in sizes two, four, and five. Our goal in at least one of our Middle East wars is to rebuild a government in our own image — with democracy for all. Instead, we are rebuilding ourselves in the image of those who detest us. I hate to see my country — and it’s a hell of a good one — endorse what we purport to hate, besmirching what distinguishes us from countries where persecution rules. Ana, Prince, and Daniel are near. Daniel, Prince, and Ana are here. 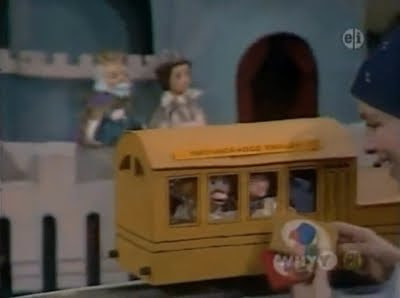 Happy schooldays, schooldays, schooldays to all. Here is just one example of the total wrongness of something I tend to be automatically sure of: everything in my own immediate experience supports my deep belief that I am the absolute center of the universe; the realest, most vivid and important person in existence. . . . Think about it: there is no experience you have had that you are not at the absolute center of. The world as you experience it is there in front of you or behind you, to the left or right of you, on your TV or your monitor. And so on. The Beloit list seems to suggest that if it hasn’t happened during your lifetime, well, it can’t really be real (witness the weirdly Orwellian statement that “Czechoslovakia has never existed”), or, at best, that you cannot be expected to know or care about it. Even the ugly word mindset reinforces that implication: “the established set of attitudes held by someone,” says the Oxford American Dictionary. The OAD illustrates that meaning with a sentence about being stuck. My own “mindset” in college probably has something to do with my antipathy toward the Beloit project. I listened almost exclusively to blues and jazz in college, some of it made by musicians who lived and died before I was born. I liked old black-and-white films. And studying literature and philosophy, I spent most of my time reading the work of people who were long, long gone. Sir Thomas Browne and Robert Burton were way before my time. Which was of course the point, “my” time being, like anyone’s, so limited. An interviewer once asked the poet David Shapiro to name his favorite living poet. Wallace Stevens, he said. “But Stevens is dead,” the interviewer objected. “But not for me!” Shapiro replied. (Having talked with David Shapiro, I can imagine the insistent energy with which he must have made that declaration.) I suspect that among this year’s incoming freshmen are some for whom Wallace Stevens (or Emily Dickinson, or E.E. Cummings, or Langston Hughes) is still living, for whom a pocket notebook and pen or pencil are tools of thought and introspection, and for whom Czechoslovakia is as real as it gets. Daughter Number Three says it perfectly: Eighteen Percent of Americans Make Me Tired. From Turkey, news of an effort to recreate Aeneas’s “historic [sic] journey” from Troy to Italy. An advance look at the covers for the twenty volumes in the final installment of Penguin’s Great ideas series. I especially like the Winston Churchill, George Eliot, and Epictetus covers. The literary critic Frank Kermode has died. Men, like poets, rush “into the middest,” in medias res, where they are born; they also die in mediis rebus, and to make sense of their span they need fictive concords with origins and ends, such as give meaning to lives and to poems. The End they imagine will reflect their irreducibly intermediary preoccupations. Frank Kermode, The Sense of an Ending: Studies in the Theory of Fiction (1967). For an historiographer discourseth of affayres orderly as they were donne, accounting as well the times as the actions; but a poet thrusteth into the middest, even where it most concerneth him, and there recoursing to the things forepaste, and divining of thinges to come, maketh a pleasing analysis of all. I’m out of step: unlike many people commenting on this story, I see nothing funny in it. It’s only grotesquely sad. Note to self and others: the next time you’re tempted to do anything on a phone while driving, consider Frank Ryan. Holy crap. J.D. Salinger’s “PERSONALLY OWNED & USED Toilet Commode” is at eBay. Asking price: a million dollars. This article explains. The Inkless Metal Pen features a special metal alloy tip. As you write, tiny amounts of this metal are deposited onto the page. The silvery markings may resemble pencil, but they are permanent and completely smudge-proof. Because it doesn’t require sharpening or refills, the Inkless Metal Pen is an amazing gift for artists or doodlers. Its “ink” is solid, so it will never leak, and it can be used upside down or under extreme conditions. Lost and found: audio engineer and jazz fan William Savory’s recordings of late-1930s radio broadcasts have a new home at the National Jazz Museum in Harlem. The New York Times has a story, a video feature, and seven audio samples. The highlight among them: Louis Armstrong, Jack Teagarden, and Fats Waller putting together a blues. Says the announcer, “This oughta be good.” It’s great. I looked up at the clock the other night and heard the voice of Alice Kramden in my head: “Ralph, it’s a quarter to eight. You’re gonna be late for bowling.” (Thank you, involuntary memory.) As you may already have suspected, the big hand was (roughly) on the 9. Had I been looking at a digital clock, I would not have heard Alice’s voice. For the time would have been 7:45, or :44 or :46. I have never owned a digital watch, and the clocks in our house are old-school. But I do prefer using a digital alarm clock. I like to wake up exactly, so as not to be late for bowling. 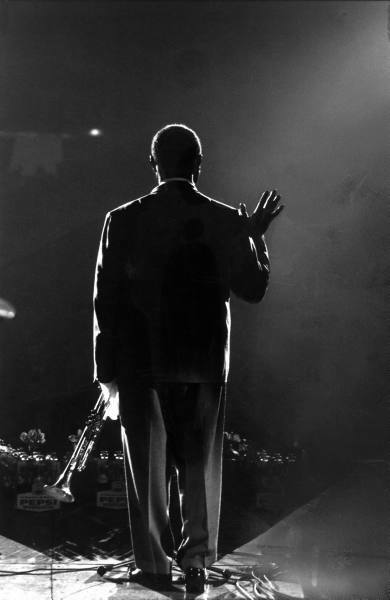 Herman Leonard, one of the great photographers of jazz, has died. From a recent exhibition: twenty-five photographs. In 1956, she made her first album, Affair ... a Story of a Girl in Love (Liberty), and appeared in her first film, the Jayne Mansfield vehicle The Girl Can’t Help It. Her image in both cases was decidedly glamorous: On the album cover she was depicted in a décolleté gown, and in the movie she sported a dress once worn by Marilyn Monroe. For her second album, That’s Him, released on the Riverside label in 1957, Ms. Lincoln kept the seductive pose but worked convincingly with a modern jazz ensemble that included the tenor saxophonist Sonny Rollins and the drummer Max Roach. In short order she came under the influence of Mr. Roach, a bebop pioneer with an ardent interest in progressive causes. As she later recalled, she put the Monroe dress in an incinerator and followed his lead. If you think you know the location, comment away. Update, 2:28 PM: Mystery now solved, in the comments. I came to the music of The Free Design very late, via their recording of Bruce Johnston’s “Endless Harmony” on the 2000 compilation Caroline Now! (Marina Records). That was all it took. An article on Wednesday about Tiger Woods’s golfing struggles heading into the P.G.A. Championship described incorrectly his change of heart about playing on the United States Ryder Cup team. His new willingness to be a captain’s pick for the team represents a 180-degree turn, not a 360-degree turn. The squat, featureless warehouse — originally a tennis-racket factory — is surrounded by retail clothing stores and restaurants serving the affluent western suburbs of Boston. With only modest indication of what wares are inside, the independent bookstore still outsells each of the four superstores in the area. Eric Abrahamson and David H. Freedman, A Perfect Mess: The Hidden Benefits of Disorder (New York: Back Bay Books, 2007). The New England Mobile Book Fair, in Newton Highlands, Massachusetts (hereafter, the NEMBF) is not mobile, nor is it a fair. Its distinctive feature is that it organizes almost all new books into hardcover and paperback sections by publisher. That scheme allows for all sorts of chance discovery. I found William Lindsay Gresham’s novel Nightmare Alley by browsing New York Review Books. And from the same publisher, Balzac’s The Unknown Masterpiece for Elaine. The photograph above shows a relatively small part of the whole: the floor stretches at least as far in the other direction. More photos can be found at the store’s website. Despite the claim to innovation (here, for instance), there is nothing new about liquid graphite pencils, which Scripto and Parker first offered in 1955. That the Sharpie Liquid Pencil’s line becomes permanent after three days — that is something new. On BBC Radio 4, Stephen Fry considers the QWERTY keyboard. There are seven days left to listen. The program’s written description should be around longer, like QWERTY itself. Every square inch of shelf and wall space and the vast majority of floor space — even the ceiling — is crammed with a riotous mélange of wares, all of it jammed together, some of it so old the packaging is discolored. 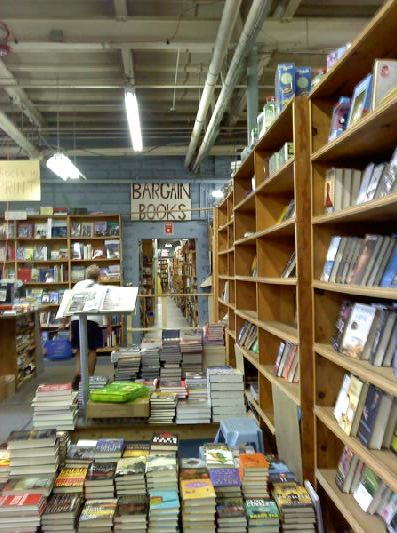 The aisles are narrow and asymmetrical and indistinguishably lined with tall, dense, unbroken shelving. What little space there is to walk through is made into an obstacle course by various wares stacked in unlabeled piles. . . . According to Harvey, the jammed-up feeling communicates the scope of the inventory and creates an ambience compatible with a hardware-buying frenzy. It must: Harvey’s packs in $113 worth of inventory per square foot, more than three times the average for hardware stores. Sales per square foot are $503, close to four times the average. Frenzy indeed: how else did we end up buying WD-40 and floor wax — among other things — while on vacation? Mark Frauenfelder has asked Boing Boing readers to post photographs of their workspaces and “tips for keeping things organized.” Thus the above photograph, which I took with a cellphone in January 2010 to let my children know what I was up to. I was working in the Intermezzo, a café in the Krannert Center for the Performing Arts at the University of Illinois in Urbana. 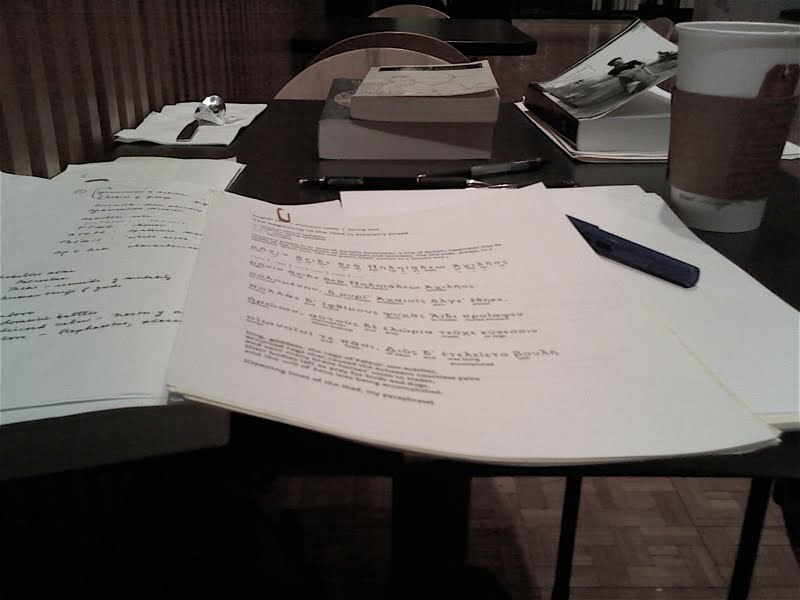 While my wife Elaine rehearsed with an orchestra, I sat at a little table and got things done. In addition to a napkin, a spoon, an empty sugar packet, and a cup of Tazo tea, this table holds George Chapman’s and Stanley Lombardo’s translations of the Iliad, George Steiner’s anthology Homer in English, Jane Austen’s Mansfield Park, pages of notes, and a handout with the first lines of the Iliad in Greek. And three writing instruments (because there can never be too many writing instruments): a Staedtler mechanical pencil, a Uni-ball Signo gel pen, and a Lamy Safari fountain pen. As for keeping things organized: my desk at home is in perpetual disorganization: a MacBook surrounded by slopes and planes of paper.¹ That’s one reason why I like working at a tiny table in the Intermezzo: it’s empty when I arrive. There is no there there, as Gertrude Stein said of Oakland, California, not until I open my backpack. ¹ To clarify: I am organized; it’s my desk that’s not. Joe Negri is eighty-four and has a new recording, Dream Dancing. YouTube has him playing the title tune (by Cole Porter) and much more. The lower level of the George Washington Bridge was once informally known as the Martha Washington. Martha was on the bottom; George was on top. Really. Spartan Tool (“Since 1943”) has a beautiful logo. 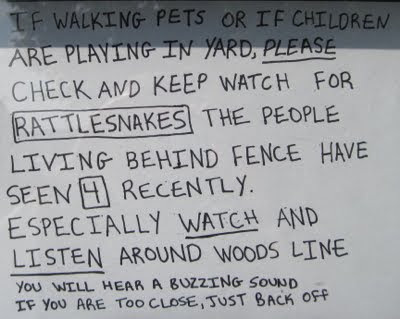 “The people living behind fence have seen 4 recently.” Four what? Rattlesnakes, at a rest stop in Pennsylvania. It is possible to drive two-thousand miles and avoid all highway-food if a thoughtful partner packs picnic lunches and dinners in an insulated bag. A tablecloth is a nice touch too. Civilization! Thank you, Elaine. Gobo is a terrific restaurant in Manhattan’s West Village. Manhattan’s S. Feldman Housewares has been doing business at the same location (1304 Madison Avenue) since 1929. S. Feldman’s store offers far greater browsing pleasure than S.R. Guggenheim’s museum. The bathrooms in the Guggenheim Museum are almost laughable in their near-unusability. Almost: because it’s not funny. The guy before me came out with his camera in hand. These photographs though are someone else’s. What was Frank Lloyd Wright thinking? Did he not understand nos. one and two? Our friend Jim can recite Dylan Thomas’s “Do Not Go Gentle into That Good Night.” And he did so at the White Horse Tavern, for our table. And — Jim made 400 chocolate truffles for a White House dinner last fall. He made 400 chocolate truffles in the White House. I’m leaving the rest for him to tell at some point, if he so chooses. It is possible to walk into The Hat Shop just to say hello to proprietor Linda Pagan (a college friend of our friend Luanne) and leave having ordered a great-looking hat. A men’s hat. “It’s a really good hat”: that’s what I kept saying, slightly dazed. 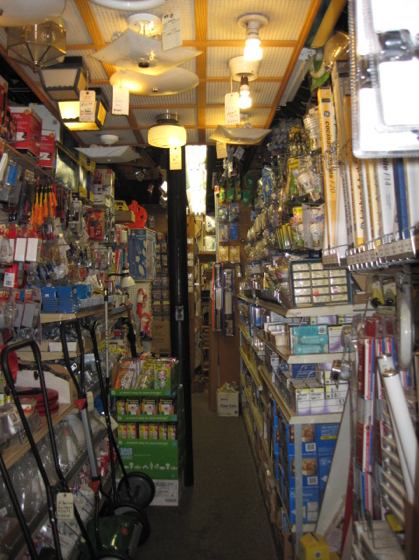 Harvey’s Hardware in Needham, Massachusetts, may be the greatest hardware store in the world. Density! More density! Like S. Feldman Housewares, Harvey’s offers far greater browsing pleasure than the Guggenheim Museum. The Tibet Almond Stick makes a great gift. It removes furniture scratches, and your eagerness to use it will help you find scratches that you didn’t know were there. AfterBite stops mosquito bites from itching. The New England Mobile Book Fair in Newton Highlands, Massachusetts, may not be the greatest bookstore in the world, but its inventory makes it a very strong contender. (The greatest, for me: Chicago’s Seminary Co-op Bookstore.) Like S. Feldman Housewares and Harvey’s Hardware, the Book Fair offers far greater browsing pleasure than the you-know-what. The slang use of pad for an apartment or flat may be related to the term pied-à-terre. Then again it may not. Both possibilities were in play from early on in the vacation. It is possible to spend two days in Manhattan — on buses, trains, and feet — without seeing an iPad (aside from those in the Apple Store) or a Kindle. Many books though, and a few magazines. Newspapers, almost none. It is possible to go as long as eight days without watching even a minute of television. “Wisdom and knowledge shall be the stability of thy times”: Isaiah 33:6, as stated above the entrance to 30 Rockefeller Plaza. The secret of Thomas’ English Muffins’ nooks and crannies is at risk. 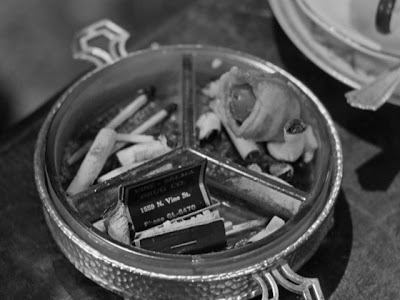 I hit Pause to try to see the inedible item Bugs Ahean (Edward G. Robinson) has placed in the ashtray: it’s a bacon-wrapped olive. (He kept the toothpick.) And then I noticed the matchbook, with an authentic Los Angeles exchange name: GLadstone. Lorne Greene’s star on the Hollywood Walk of Fame sits near 1559 Vine (“just Vine”) today. Before World War II, a few localities used three letters and four numbers; in most cities with customer dialing, phone numbers had only six digits — two letters followed by four numbers. As I was about to say, The Little Giant is a fine comedy. It even has a pocket notebook. 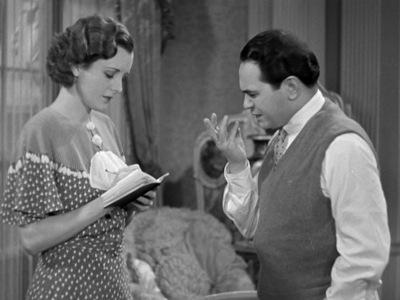 Yep, pre-Code. The Little Giant also features a telephone exchange name. Pete Seeger sings a song that he wrote with Lorre Wyatt: “God’s Counting on Me, God’s Counting on You.” It may not be a great song, but it’s a good one for these times. The message — tikkun olam — makes sense in any language. Thanks, Luanne and Jim, for news of this song. For Elaine in Arkansas (“the other Elaine”): Ernie Pyle is one of the writers whose work appears in the Library of America’s Reporting World War II: American Journalism 1938–1944. Pyle was born 110 years ago today. “Creative Personality Checklist,” by Olly Moss. Which pencil are you? One of the most distinctive qualities of E&J Brandy is its remarkable character. This is accomplished by a vertical blending of brandies of different ages from the finest white oak barrels which we personally have selected. This expensive and time consuming aging process also develops the full and natural brandy flavor of E&J Brandy. Character would be the sum total of a thing’s qualities, not one of them. “This is accomplished”: There’s no clear referent for this. Character cannot be accomplished. “Vertical blending”: Meaning that the brandies are poured in from above? I can find no evidence that “vertical blending” is a term generally used in brandy-making. It seems to be used only by E&J. “Which we personally have selected”: Silly: the brandies cannot be blended without being selected. (Here are some fries. They are made from potatoes which I personally have selected.) But it may be the barrels that have been selected. Before they were filled? Afterwards? “This expensive and time consuming aging process”: This second this is ungainly. (A good way to improve almost any piece of writing: reconsider every sentence beginning with this.) “Time consuming aging process”: redundant and repetitious [sic], and missing a hyphen. “The full and natural brandy flavor of E&J Brandy”: Yes, brandy should taste like brandy. The phrasing here reminds me of the Ennet House Drug and Alcohol Recovery House in David Foster Wallace’s Infinite Jest. Blended from brandies aged in white oak barrels, E&J is a brandy of distinction. Careful selection and aging develops E&J’s full, natural flavor. I find plainness and understatement much more convincing. But I’m not about to buy a bottle of E&J and test the truth of my sentences. I like red wine (and sometimes beer, and sometimes bourbon). Thanks, Joe, for this label.